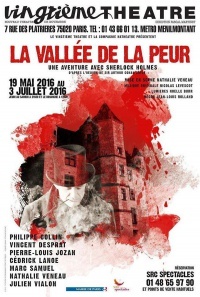 La Vallée de la Peur (The Valley of Fear) is a French play produced by Natheatre Company and directed by Nathalie Veneau, teased on 22 march 2015 at the Manoir de Courboyer (Nocé, France) and performed from 19 may to 3 july 2016 at Vingtième Théâtre (Paris, France), starring Julien Vialon as Sherlock Holmes and Marc Samuel as Dr. Watson. 90 minutes. The play is an adaptation of the Conan Doyle's novel: The Valley of Fear. This page was last edited on 22 January 2018, at 14:02.